Do you already have any of these (I have a few and most are on my wish-list). Which are your favorites? Also, Shopbop’s Event of the Season Sale starts today!! Use code EVENT17 to get 20% off orders under $500 and 25% off orders of $500 or more. The heeled sandals and the mules are my favorites! They are just so beautiful and essential for this season! Great post! I LOVE all your picks!!! Awesome inspo! I wish I could do the heels but I just can’t. Those last pair of wedges are perfect! Def going to add those to my summer shoe rotation! I just recently got those blush flats and I love them, they are so cute! And those bow flip flops are darling! Don’t you love them?! I have them and have been wearing them so much lately! Loving all of these. I have been so on the fence about mules, but you’ve linked some super cute ones!! The mules and flats picks are my favorites! I really love your selection here, Rach, especially those blue flats and all the flip flops, so cute! Thanks for sharing and I hope you’re having a great week so far! 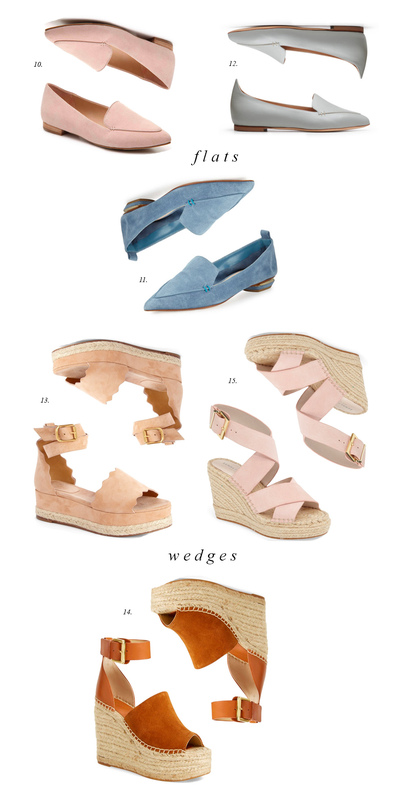 Wedges and flats are my go-to’s right now for spring! LOVE your picks! The flip flops and the wedges are a must for my closet! Can you do a Shopbop round up for the sale this week? Maybe just what you would grab while it’s on sale? I love so many of these options! I now have a bunch of open tabs on my browser. Also really loving the colour scheme, I like my shoes to be subtle so they go with as many outfits as possible. I need number 14 in my life. Want them all! Especially 7 and 15!! I am absolutely obsessed with those platform wedges. However, since I am already pretty tall, I am worried those four inches would make me feel like an absolute giant! I am hoping to see a shoe that comes out that’s maybe a little shorter. But those other shoe suggestions are fabulous!